Personally, I hate the plastic bags and do understand they can come in handy. We take our canvas bags to the store and use brown sandwich bags to put the used cat litter, dead birds, or whatever in and toss. I am so sick of seeing plastic bags blowing along roads not only in AZ but other states also. I have always re-used the plastic bags to toss out the kitty litter. Never thought to use the small paper bags instead. A great tip that I will begin to implement! For those of us who are quite a bit older, we remember when stores used paper bags. We always saved and reused these, too. But along came the "environmental" movement (one version of), and we began to be "schooled" that we were evil in causing so many trees to be murdered. 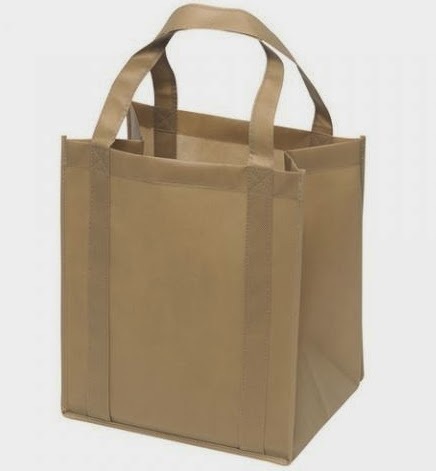 Then stores began to charge us for paper bags and to have store cashiers give us looks that made us feel guilty if we chose the paper over the plastic. Then came the time when we were no longer ALLOWED to choose. Paper bags disappeared altogether, and plastic reigned! There is always a new "evil" product on the market. Now plastic is bad, because paper can at least decompose in the landfills that dot our once minimally consumerist landscape. But garbage is still going into the ground, and most of it is BOUGHT at the stores not handed out in the carry bags. And inside either paper or plastic -or just dumped al natural into the landfill are millions of plastic packages for every conceivable item sold on this planet. The best any of us can do simply is to recycle, reduce, and reuse all we can before finally having to pitch it into the landfill. And let's not make landfills the new bugaboo either. It's landfills or rats infesting our land. I mean real rats, not just the ones in Washington, D.C.
had this talk with my mother. asked if we had so much garbage. no, the butcher wrapped your meat in paper and string, which string we saved and reused. nothing was wrapped in plastic. now i'm always hauling recycling and garbage. some of the items are nearly impossible to get out of their plastic body bags. i use scissors or box cutters [dangerous] to open packaging. i can't see how all that packaging is better. i don't know how someone with a sprained wrist can get to his food or medicine. I think she meant brown paper lunch bags. I went out to wash some deck furniture to put away for next year, had the soap, bucket but for got the rag. It is distance (Ihave a bad knee) to walk back to the barn.so there on the table was a plastic grocery bag. I used the bag like a rag except for holding water like cloth it worked great and no rags to wash. Some people crochet some lovely items from plastic bags.Instructions to do so can be found on the net.Just look for plarn patterns. My grandmother used to weave throw rugs from plastic bread sacks. They worked great for outdoor rugs. The southwest seems to have a cultural issue similar to many third world countries I have visited. Central Asia, SE Asia, Latin America, Africa in that they do not put trash in trash cans. Arizona and California have lots of bags and other garbage stuck against fence lines due to the wind and lack of ground cover to stop them while here in eastern washington with a similar climate but more wind there are many fewer bags blowing around. Another example of government deciding we the people are to lazy and incapable of taking care of our selves by not allowing us to own a problem item. How about the culture changes so that we enforce cultural norms about throwing trash in the right place, instead of having some bureaucrat make our decisions for us. Newsflash about enforcing cultural norms here in Southern California, The Illegals don't care. I live in rural area where everytime some genius Assemblymen wants to fix a litter issue they increase the costs at the Dump to we Law abiding people . The result is an increase in Illegal dumping here in the dessert.I have personally taken pictures and correspondence from the stupid dumpers trash piles to my local sheriffs sub station. They say thanks and nothing ever happens. This new law by Jerry moon unit Brown is another one of his Idiot leftist policies to inconvenience us but return favors to his union buddies and political supporters. As far as the bags Go, The newer ones actually decompose at a fast rate. Especially under the dessert Sun. I have had bags I kept Parts I bought at home depot or Lowes actually disintigrate in my workshop.with no sun exposure. Not getting the environmental impact that these Bags pose to the planet. I can tell you about the destruction of our area due to huge Solar Plants and Wind mills that have taken over our formerly beautiful landscape.The Construction has caused More cases of valley fever than we have seen in years. We had a Black bear come down in the desert where we had not seen them before. The wind mills are also Killing Raptors at an alarming rate. All in all I have less a problem with the Bags than this Green energy Boondoggle. I agree it should be our Choice. But the Narcisstic left always knows better. I remember seeing a news article about the incidence of food-born diseases increasing with reusable bags. It seems that when chicken or beef juices leak into the reusable bags, they contaminate the next shopping trip's foods. Unintended consequences. People should be smart enough to know to throw away any plastic bag that has held meat, poultry, or dairy products (like unwrapped cheese) or any other product such as leaking chemicals that could affect health. Otherwise, reusing plastic just for trash is fine. Even reusing washed Ziplocs is okay. One has to use common sense and think about what the bag held and what it will be reused for. Sorry - the government doesn't (nor can they) provide "Common Sense Training"; we still are expected to do some things for ourselves. Exactly - this is one of the problems with the reusable bags; they collect bacteria from a variety of sources and must be washed regularly. 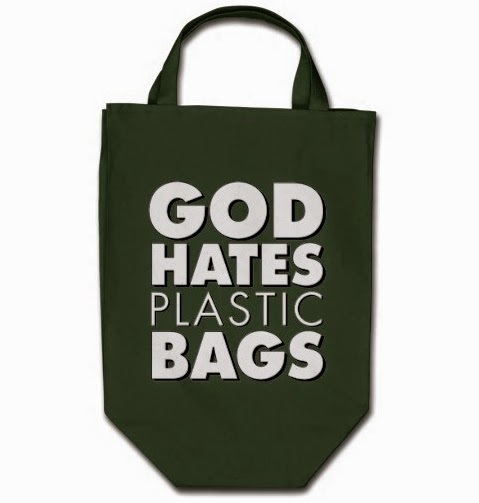 Another problem is that for them to be better for the environment than plastic bags, because of the greater energy and materials required to make them, they have to be used 200 TIMES - I've never seen a 'reusable' bag that lasts that long! The clerks have always commented on my nice clean reusable bags. I wash them every couple of months and whenever they get soiled in between. They say some are quite gross and they do not even want to touch them. I have used some of my bags for 15 years and they are finally starting to wear out.I also use (and save and reuse) the plastic bags if I forget to take in my cloth bags. My first bags are over 15 years old and still going. My cheap $1 bags are all at least 5 years old and still going strong. Acid rain was a lot like the current global warming scam. Just another way for the federal government to tax and control. Acid rain? Government convinced their sheeple that every fish in America was suppose to die by 1990. I guess they never got the memo. Even the government has moved on from that whopper. Now their sheeple are suppose to believe that 2 airplanes took down 3 towers. Sorry but 1,700 engineers and architects are not buying the government's story about Building 7. What's next? The sudden appearance of a 'miracle cure' for Ebola. Roll up your sleeves sheeple. We live in a rural area with no garbage service, and dump fees are pretty high. I never understood people returning plastic bags to be recycled or just not using them at all and then buying plastic garbage bags at the store as if Wal-Mart, Target, or other store bags are not as trash-worthy as Glad or Hefty garbage bags! What sense is there in that? We use the plastic grocery bags in our bathrooms, office, and to take out icky kitchen trash until it can all go to the dump. Because we have bears, we often double bag messy kitchen trash before putting into regular lidded trash cans. So while I agree with recycling, reducing and reusing -a philosophy of thrift I was taught way back by my grandparents and parents, if people have to substitute one plastic garbage bag for another, how exactly is that helping except to sell more Glad and Hefty trash bags? I believe that the thinness of the plastic will cause them to degrade by the sun fairly rapidly. The paper bags can be used to wallpaper with. We have one ceiling covered with the bag material colored with several different colors of paint and torn in random shapes. You then glue these to the wall using wallpaper paste and if you are lucky enough to have an artist for a wife it looks very nice. I have also seen the bag material with no coloring put on a wall and the small pieces torn in random patterns looks almost like suede. When you have five house cats filling the litter boxes plastic bags are practically a necessity! "Destructive to the environment"? If you are referring to plastic bags as litter the problem there is throwing trash where it doesn't belong not the bags. If the problem is that it is made from oil I can assure you just as much plastic will be made from just as much oil.so there is no benefit from that decision. I just don't understand the whole plastic bag hysteria. I was traveling through California (in my gas guzzling motor home) and stopped at a Walmart ot pick up a few things Got to the checkout and they had no plastic bags, no paper bags, no bags at all. The town had outlawed them. Lucky for me he had rung the items up but I hadn't paid for them. So I said, and I quote, "no baggy no payee" and left without the items. Where I live there is a Winco in two different towns 18 miles from me. One of those towns bans plastic bags and puts a $.05 tax on paper bags. So we shop at the other town. That is what these bans do, they cost jobs and profits and don't do diddly squat for or against the environment. It's all a feel good about yourself thing. Why not get the reusable bags you ask? Well in fact I do have some, somewhere. But have you heard that people are getting sick from reusable bags? 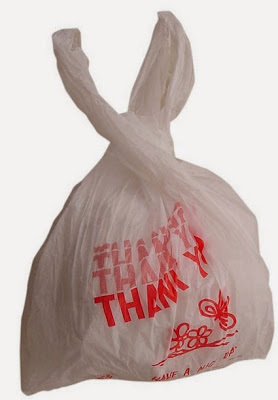 You buy food and bag in in your cloth bag and the meat/chicken package leaks a little and contaminates the bag. The CDC recommendsthat you don't reuse bags. Hmmmm. In some places, the laws are supported by stores - they love it when by law they can charge 5 or 10 cents for a bag that costs them a fraction of a penny and they used to give away free. If you like plastic grocery bags, U-Line.com has them for as little as $45/1000. a thousand bags is a lot, especially if you reuse them once or twice. And no, Heather, the acid rain isn't caused by burning plastic bags in the southwest. It is caused by power plants more than anything else, and the feds have done a LOT to remove the sulfurs from stack emissions that caused acid rains...you haven't had terrible acid rains for over 10 years (more like 20). Hmmm, they ban plastic bags, but they won't ban the throwaway diapers. I would think those diapers are more of a problem in a landfill that plastic bags. I guess they didn't want to face a public that would be forced to wash diapers. I use mine for a lot of things but mostly for my canning jars after they are empty. I wash the jars and place each one in a bag so when I store them in our shed they will stay somewhat clean and I won't have to do a lot of scrubbing when it is time to can again.